November 2018, I was in Ukraine for my fourth trip in four years. Covering four cities, I spoke with groups of Ukrainian military chaplains, psychologists, soldiers, and military academy cadets in addition to widows and parents of fallen “heroes.” Little did I know, just a couple of days after leaving Kiev, the Capital, the Russians would block access from the Black Sea to the Sea of Azov, capturing three Ukrainian ships and holding twenty four sailors as prisoners. In response, Ukrainian President Poroshenko declared martial law throughout several of the cities where I was ministering. When I heard about this decision back in the US, I wondered if I could have been allowed to leave since I was close to the Black Sea and not far from the line of conflict. Known as a conflict between Russians living in the East (Separatists) against western-oriented Ukrainians, the war is now in its fourth year. 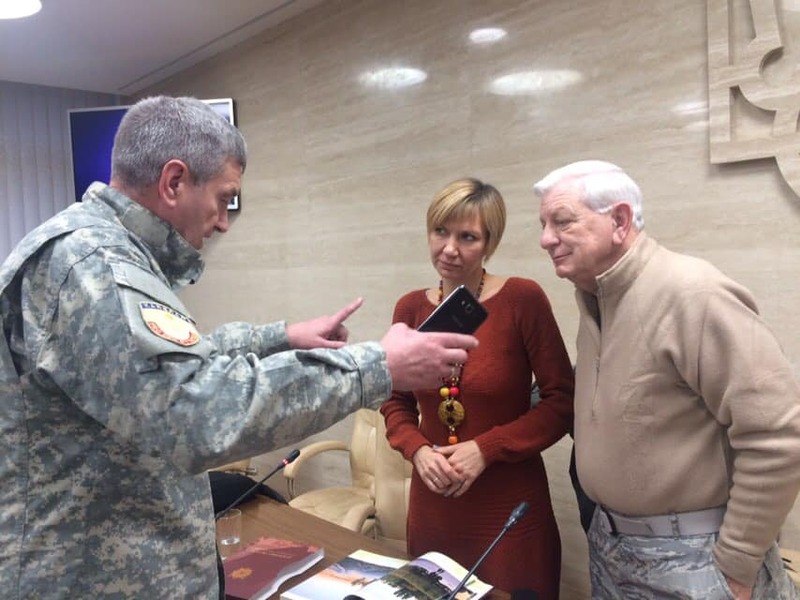 From the time President Putin took over Crimea and initiated the conflict in Eastern Ukraine, I have been sharing my experience with their all-volunteer chaplain corps. I regularly speak on PTSD, Combat Moral Injury, and Reintegration issues (From Battle Mind to Home Mind). 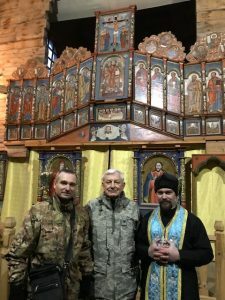 Ukraine has suffered over 5,000 combat deaths leaving many parents and wives of solders with little to no care from churches, communities, and government. To fill the gap several American organizations have stepped in for training and instruction for these chaplains. I have been honored as a retired Air Force Chaplain to be part of the ministering teams as a civilian volunteer with CRU Military Ministry. I call my most recent trip “planes, trains and taxis.” I spoke thirty two times in the cities of Lviv, Mykolaiv, Zaporizhia, and Kiev, plus some side trips to meet with specific chaplains. I did four television appearances, one radio appearance, and a local newspaper interview. I spoke to hundreds of soldiers, a military academy, a Veteran hospital, a public high school general assembly, plus a city hall meeting of psychologists and Orthodox priests. In Lviv, I addressed Greek Catholic chaplains and seminarians considering the chaplaincy. In a country with a history of Eastern Orthodox Christianity, the only chaplains officially recognized by the government at the beginning of the war were Orthodox priests. Other protestant ministers, however, volunteered to go to the front, live with the soldiers, and even take fire with some being killed. Since very few protestant churches pay their ministers, these pastors would go on their own money, risking their own lives while serving their troops and leading many to Christ. Their commitment as a shining example of the love of Christ began to influence even Orthodox priests. As one of these priests told me, “At the front there are just chaplains – not Baptist, Orthodox or Catholic.” Another one confessed, “I am Orthodox but Protestant in my heart.” So this war is breaking down long-standing denominational barriers and bringing about a certain unity of ministry. Christ is being exalted, the Bible studied, and confessions of faith being made. Since my first trip after the war began, almost every time I spoke, military and civilian psychologists would show up. Initially, I thought they might be there just to “check me out” as a possible security threat. However, now I realize after seventy years of atheistic, materialist, behaviorist thinking, the young psychologists are searching for deeper understanding about the nature of humanness. They seem very curious and open when I start talking about the “soul” and “combat moral injury of the soul.” Spiritual categories are new to them, and they realize Post Traumatic events like combat are not solved through medication or psychotherapy alone. This leads to interesting discussions about forgiveness and soul cleansing, which leads to the work of Christ. Thus, I am seeing a refreshing openness to Christ as a personal relationship not the dry empty ritualism some have experienced in the past. One Ukrainian chaplain had such a heart for widows that he started a weekly care group for both parents and widows of “heroes” as they call them. Most of these had no experience with Christianity. 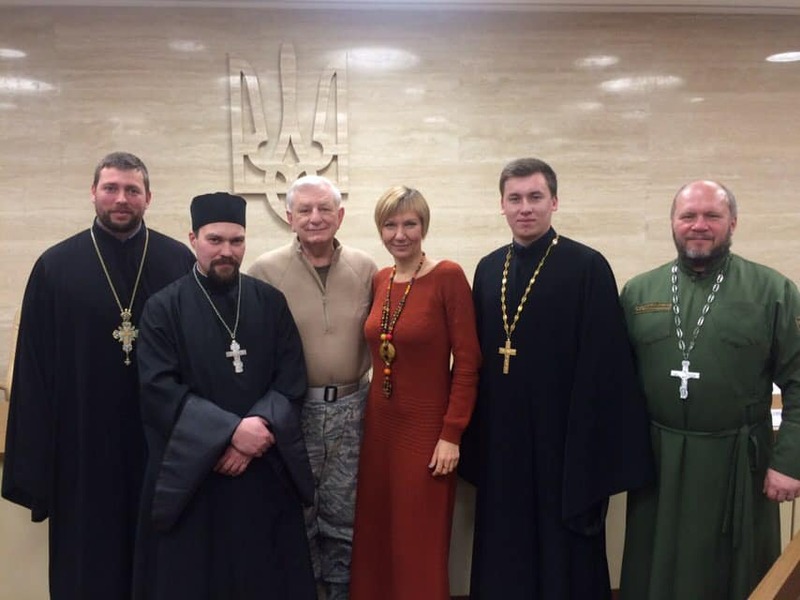 After several mid-week meetings, he brought church musicians to sing and play Ukrainian songs. As more widows and parents joined, he realized he had started a new church. (I’ve had the privilege of speaking a couple of times to these meeting). Other chaplains began doing the same, and now it has launched a whole church planting ministry simply created from ministry to war widows and parents. Many have come to know Christ while others still come for the fellowship and care. God is at work in the midst of this war! I have already received an invitation to meet with commanders at the front during my next trip. I am so honored to share our lessons learned from the US decade of wars in Afghanistan and Iraq with these fellow brothers and sisters in arms. My mission statement borrowed from the Apostle Paul is: “We have a God of all comfort who comforts us in all our afflictions, so that we might be able to comfort others in theirs.” (II Corinthians 1:3-4) So, we comfort out of our own afflictions and traumas in the name of Christ. My experience in Ukraine and other countries has given me a renewed appreciation for the education I received at DTS along with my time of interaction with fellow professors while on the faculty. Often, I did know what I was going to be asked by skeptics, members of other faith groups, or journalists.  I realized daily I was drawing upon the reservoir of Biblical and theological knowledge gained from the classroom, the snack shack, fellow students, and lunches with professors. As Prof. Hendricks often said, “You can’t profess what you don’t possess.” How true.